An emergency key for Kia cars, cut to fit the locks on your car. This key will suit most models from 1995 onwards. Models Include: Carence 2001-2006, Carens 2001-2006, Carnival 2000 on, Clarus 1998-2001, Joice 2000-2008, Magentis 2001 on, Mentor 2002-2004, Morning 2006 on, Optima 2002-2008, Picanto 2004-2008, Rio 200 on, Sedona 2002-2005, Sephia 2002-2004, Shuma 1998-2001, Sorento 2002-2006, Sportage 1998 on. We do not use original Kia blanks, we use high quality steel blanks manufactured by Silca. 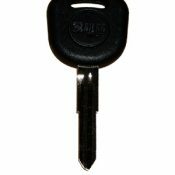 A chipped Kia car key cut to photo or key number for cars manufactured after 1995. This key will need programming in order to start the engine. Models Include: Carence 2001-2006, Carens 2001-2006, Carnival 2000-2002, Clarus 1998-2001, Joice 2000-2008, Rio 2001-2005, Shuma 1998-2001, Sportage 1998 – 2003.